Having ice on hand all the time can be a real battle. It’s one you probably find yourself losing most of the time. You probably find yourself wondering how your family can go through so much ice so quickly, and then you think about all the things you use it for. Without even realizing it, ice plays a pretty big role in your life. There’s the ice you need to fill the cooler for the tailgating party. There’s the ice you use to make healthy afternoon smoothies for your kids. You ice use to make cocktails when friends come to visit. You use ice to soak your sore muscles, and you use it to keep the shrimp chilled at a weekend party. With all these uses for ice, it’s important to make sure you always have plenty around. Filling tray after tray with water is tedious, and face it, no one in your family cooperates. 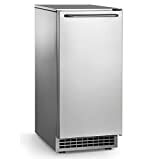 Built-in ice machines on freezers are a step up, but even they come riddled with problems. Someone how they never make ice the way the manufacturer claims. That’s because they’re number one job is to a freezer, not an ice machine. What you need is an ice maker that can keep up with your family. Scotsman nugget ice machines are ready to answer the call. They can keep up with even the most ravenous ice users, and they make a great addition to your home. Here are five advantages of owning a Scostman ice maker. You might hate that your family members chew on ice, or you might be the one with the hard-to-quit habit. Either way, you know that it’s not the best thing for teeth. With Scotsman ice, you don’t have to worry. Their ice makers create a unique type of chewable ice. They started making chewable ice back in 1981, and it has been an integral part of their process ever since. The soft, compact nuggets are fun to chew and crunch, and know one is going to chip a tooth in the process. The same unique shape, and texture, that help to make the Scotsman ice chewy, is what makes it perfect for blended drinks. Regular ice cubs can be very hard on blender blades and motors. In fact, most restaurants and cafes that make blended drinks on a regular basis, use blenders that are practically industrial strength. So to save your blender, you can use Scotsman ice for everything from smoothies to frozen daiquiris. The texture of the ice even helps it to absorb flavors better, and it helps to improve the taste of your beverages. 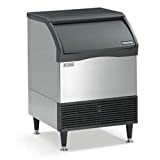 Having an ice machine that works well is the ultimate goal, but having one that looks good, is a nice little bonus. A Scotsman undercounter ice maker fits in perfectly with any kitchen aesthetic. Your friends and neighbors will hardly notice that it’s there, but they will surely appreciate the steady supply of ice-cold beverages that is can sustain. The stainless steel options will blend right in with the rest of your modern appliances, but you can even customize the front panels of some models to match your cabinetry. Naturally, the number one thing that a good ice maker should do, is make tons of ice. Scotsman ice makers can produce up to eighty pounds of ice in twenty-four hours. That much ice can help you rule the family reunion and make you the sideline-hero of any soccer match. You’ll never be without enough ice to fill a cooler, or stock a bar. No one will ever have to run to the gas station to pick up an emergency bag of ice for your New Year’s Eve party. In fact, you’ll never have an ice related emergency ever again. You probably thought having one of these in your kitchen was cool enough, but what about one on your patio? Imagine relaxing around the pool, and having chewable ice for all your summer drinks, just a few steps away. Imagine freshening up your lemonade with a scoop or two of ice as you sunbathe, and catch up on the latest bestseller. You and your family won’t have to trek back through the house to get more ice, and you’ll have the most state-of-the-art outdoor bar on the block. A Scotsman nugget ice maker can make a world of difference in your home. You and your family will always have the ice that you need, and you can be sure that you’ve invested money into a machine that will perform well and produce lots.